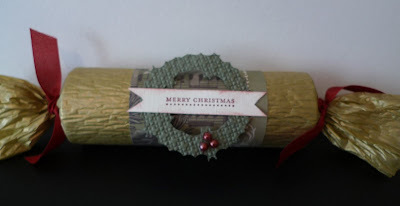 Karina's Kreations: Christmas Cracker Fun! Isn't this a great project? I designed it for our Millet meeting last weekend. My friend Jen showed me how to use the Bitty Bat punch to make a Christmas wreath and I had to try it. I punched five bats out of Always Artichoke card stock and attached the ends with 2 way glue pen forming a wreath. I placed them in the Square Lattice Textured Impressions Embossing Folder and ran it through the Big Shot die cut machine. The pearls were colored with Classic Cherry Cobbler re-inker and a paint brush. Clear embossing powder was sprinkled over top and set with the Heat Tool. The Christmas greeting is from the Teeny Tiny Wishes stamp set. To make a cracker, start with 6" x 5-1/2" card stock. Place Sticky Strip along the 5-1/2" edge and make a roll. Place a snap piece inside the roll along with a treat. Cut a 12" piece of waffle paper and cover the roll. Secure the ends with Cherry Cobbler seam binding. I bought the snap pieces at a craft store for $2.50. The designer paper is from the Deck the Halls Designer Series paper pack in the holiday mini catalog.